The Dynamo has a comforting foam casing that acts as a barrier between your child’s wild exploration and you having a heart attack. It’s also great for all ages: Your two year old can use it as a teething toy, which is totally fine due to its non-toxic EVA foam material. Your five year old can play daddy, swinging it like a briefcase by the cool handle that doubles as a dual-angled stand. It even has the power to enchant parents, but if not, they can easily remove the tablet and switch to "adult mode". The Dynamo also comes with a plastic screen protector that won’t hinder use, and openings for all necessary ports and cameras, providing reassuring cushioning without taking any functionality away. Durable rubberized 100% non-toxic EVA foam cushion for best shockproof protection. Innovative, unbreakable single piece bumper (easy to wash and clean) fully covers back of device. Raised bezel around screen edges protects from hard falls, shock and impact. Gives your iPad indestructible armor body protection it deserves. Also included self-applicable clear screen protector for shatterproof tablet protection. Comfortable grip handle designed as one hand carrier (perfect for smaller children hands) for easy carry and travel. Handle folds into hands-free upright stand for learning music, watching video, reading books, playing games and using educational apps. Kickstand display for better typing & drawing angle. Case handle can be mounted to car headrest for back seat entertainment. One case to rule them all? 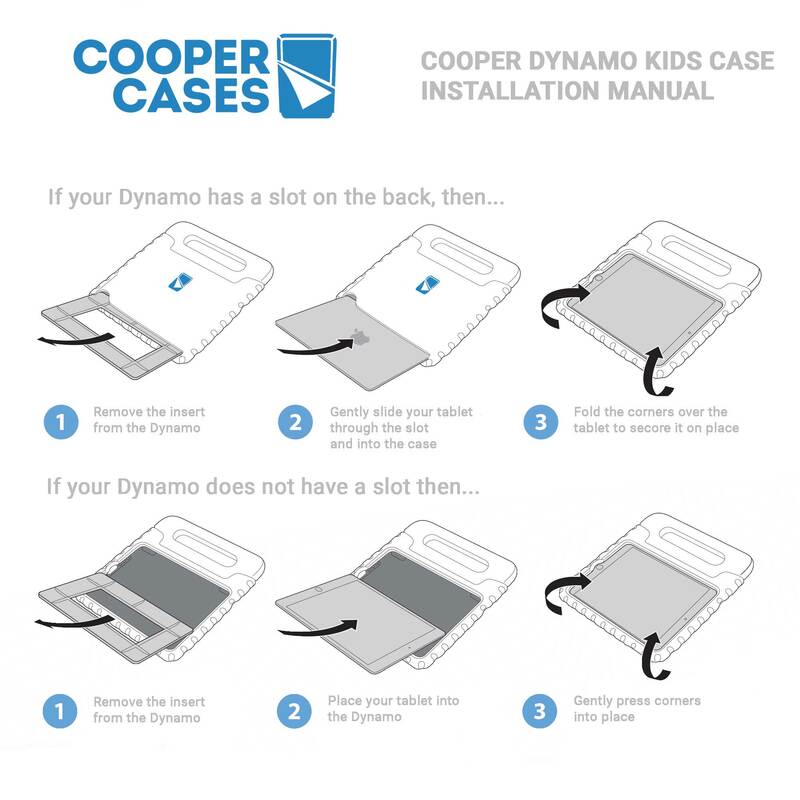 The Cooper Dynamo is made of lightweight, colorful, sturdy, child friendly and kid safe EVA foam. Get it in lime green, blue, orange, purple, girly pink or black to match any baby, boy, girl, toddler, child, teen of any age group! Also suitable for active adults (gym, yoga, training), professionals working in medical fields and disabled people. Remove tablet placeholder plastic via the long groove at the bottom of the back of the case. Insert tablet through the same opening, don’t worry about bending and tearing the case, it’s made for this kind of treatment. Once inside use at two angles: lying down for typing and standing up for watching. Alisa B. Reviewed by Alisa B. Great case, would buy again! I love the featherlight weight of the case. It is also very easy to grab and hold securely. The problem is with the upright position of the case. It is so vertical that it is unstable. I previously bought a case like this for a smaller iPad and love it. Maybe the iPad Pro is too big to be stable in the upright position in this case? Natasha b. Reviewed by Natasha b. Love it, works perfect for my nephew! gina p. Reviewed by gina p.